Your furry buddy probably loves being spoiled. That’s why when it comes to your cat’s nutrition, you want high-quality without breaking the bank. Cats require protein rich diets. Most cat food brands fill their food with unnecessary grains. Avoid costly vet bills and optimize your kitty’s health by getting the best grain free food for cats. Cats can have carbohydrates, but there is no nutritional value in them. If their food is filled with an excessive amount of carbohydrates that might raise a red flag. 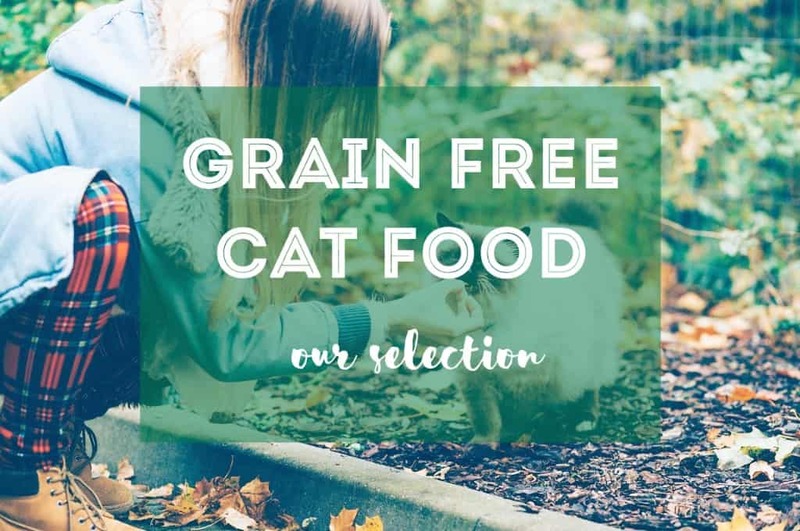 Take a look at our guide on the best grain free food for cats to see if switching to grain free is right for your kitty. Your cat shouldn’t eat more than 2 portions of carbohydrates. Some cat foods have high levels of carbohydrates, going all the way up to 50 percent. If you don’t obey this rule your cat might experience some health problems. Things like behavior issues, skin problems, or even obesity and kidney stones are possible and common with cats. Learn more about what cats need and don’t need in their diet in our ultimate guide to cat nutrition. Cats are carnivores, meaning that they have the need for meat. Cats can digest certain plants but only in limited amounts. Protein should be their prime choice when it comes to their diet. Note that protein needs to come from premium animal sources. Any canned cat food or dry cat food that contains corn, wheat, soy, fillers, in addition to artificial preservatives or colors is a big no-no for your cat. Simply, grain free cat food is the absence of unnecessary grains like wheat, soy, corn, etc. In most cases, grain free cat foods will be the highest quality cat foods, as protein, healthy antioxidants, legumes and fruits will be the prime ingredients instead. This of course accounts for a higher sale price, too. But in the long run you avoid costly vet bills associated with poor nutrition. It’s a win-win. If you want to see for yourself, just compare the ingredients of a MeowMix bag of cat food (full of garbage) and something high-quality like Orijen or Blue Buffalo cat food. This brand is just one out of several made by WellPet. Wellness food is formulated by animal nutritionists as well as veterinarians who know exactly what your cat needs. Their food is designed in such a way that they avoid grains, and put the focus on turkey, duck, chicken, and lamb protein. 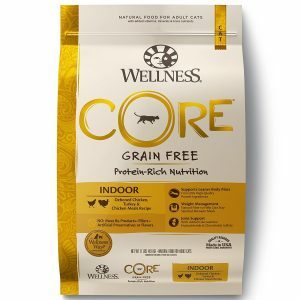 Wellness avoids artificial additives and adds supplements with probiotics that help with the digestive system of your cat. This also helps with your cats skin and coat. They have got a huge selection of dry and wet food products so your finicky kitty can choose his favorite. 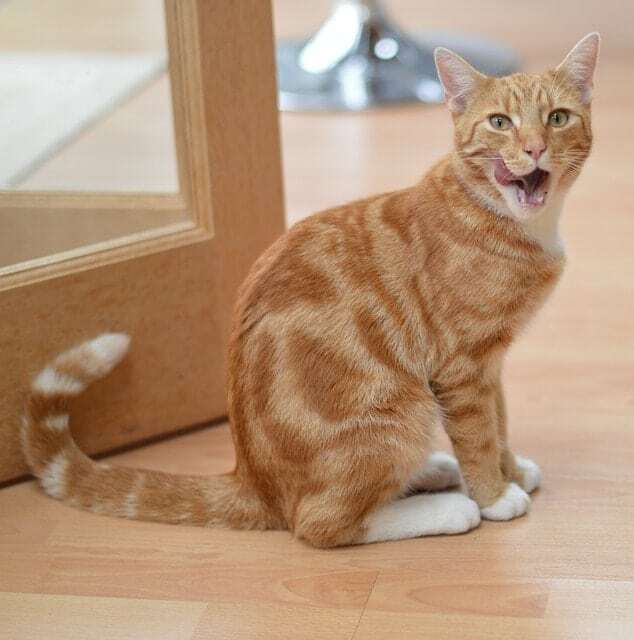 Kittens, adults and indoor cats all have specially formulated cat food by Wellness. Wellness also offers patés, shredded entrees, chunky recipes, and meat duos that your cat will love! 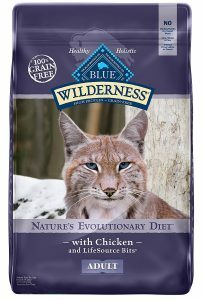 A highly recommended brand is the Blue Wilderness grain free cat food. It is made with high-quality chicken, duck, or salmon and has no wheat, gluten, corn, or soy. It is filled with protein which your little hunter will love. In fact, it has 95% real protein. It is rich in antioxidants in addition to healthy vitamins and minerals. Blue Buffalo’s food is packed with omega fatty acids, plus minerals, taurine and other essential acids that your cat needs for proper digestion. Thanks to these supplements your cat will also have stunning fur, lean muscles, and a healthy immune and digestive system. No wheat, corn, soy, meat by-products, etc. Taste of the Wild makes quality grain free cat food at an affordable price. They are well known for having a higher meat protein content than other manufacturers. You can choose between two formulas for your cat, either the Canyon River Feline with Trout & Smoked Salmon or Rocky Mountain Feline with Roasted Venison & Smoked Salmon. Both of these come in wet and dry forms. Their food is rich in protein that will help your furry buddy to get strong muscles. Completely grain-free and filled with omega 3 and 6 fatty acids which help with your cat’s skin and coat. Their products contain no grain, corn, wheat, or artificial flavors as well as preservatives which is a sign of high-quality. 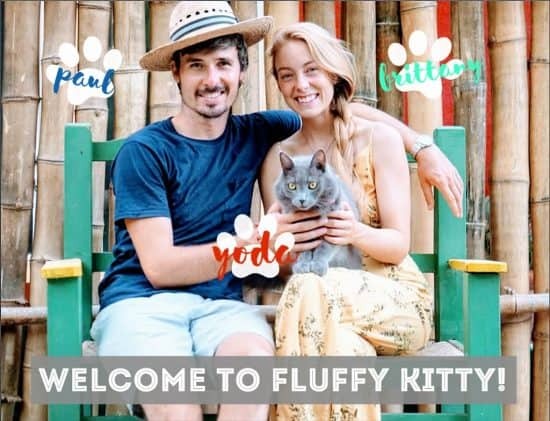 Their food has probiotics that will help your cat with its digestive health. 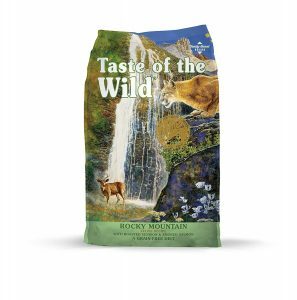 Taste of the Wild is made in the USA (with globally sourced ingredients) by a family who runs and owns the own company. No grains, wheat, soy, corn, fillers, etc. Any out of these three options for best grain free food for cats will satisfy your furry buddy. If you are thinking about going grain free, know that these distributors are some of the best choices for your kitty. Overall, the cheapest (per pound) is Taste of the Wild and the most expensive is Wellness CORE. 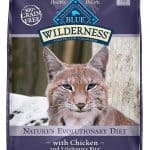 If you are looking for an affordable premium-quality grain free cat food that your cat will love in either dry or wet versions, then the Blue Wilderness might be the best grain free food for cats.